Mark and Melissa Cain are thrilled to have found Jade, a babysitter who is brilliant with their young children. Having seen her own house burn to the ground, Jade needs them as much as they need her. Moving Jade into the family home can only be a good thing, can’t it? As Mark works long hours as a police officer and Melissa struggles with running a business, the family become ever more reliant on their babysitter, who is only too happy to help. And as Melissa begins to slip into depression, it’s Jade who is left picking up the pieces. But Mark soon notices things aren’t quite as they seem. Things at home feel wrong, and as Mark begins to investigate their seemingly perfect sitter, what he discovers shocks him to his core. He’s met Jade before. And now he suspects he might know what she wants … Mark is in a race against time to protect his family. But what will he find as he goes back to his family home? This was a fantastically creepy and at parts downright terrifying read. A certain 5* for sure. I didn't really know much going into this, I had requested it on NetGalley then it sat on my TBR for some time, and it was a case of a random pick to read it - but oh am I glad I did. I was one big ball of anxious/stressed mess from beginning to end. We meet Mark & Melissa a strong, loyal and loving couple as they are beginning to face a few small troubles, nothing major just day to day work/life/family balance. So when they find Jade (who has moved next door) she couldn't have come along at a better time. I mean for Jade, its an awful time as her cottage has burned down, but when Mark & Melissa offer to take her in, it works out wonderful for them. A built-in babysitter. An arrangement that helps everyone. This arrangement especially helps as Melissa is going downhill again, her depression is seeping back in and Mark is concerned but as there is a major case at work he finds it hard to resolve the issues and Jade is left to pick up the pieces. However, not is all as it seems and as Marks starts to wonder a little more about his perfect babysitter, everything changes. 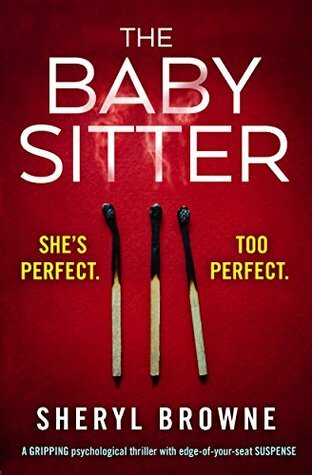 The babysitter was a fantastic read - and whilst in some parts i guessed what was happening, but that didnt make it an easier read for me. I was literally worried, stressed and panicking all the way through - i was concerned i wouldn't get the answers i wanted, i was worried what the outcome would be for the characters and i was so fully invested in this it crept into my night time thoughts. Please, if you read one thriller this year - go for this one. Hi, I’m Sheryl Browne. I live in Worcestershire with my partner and a variety of disabled dogs. According to readers of my thrillers, I also apparently make an excellent psychopath. ;) Writing powerful psychological thriller and contemporary fiction, my latest thriller THE BABYSITTER is published by fabulous BOOKOUTURE. A member of the Crime Writers’ Association and the Romantic Novelists’ Association, and previously writing for award winning Choc Lit, I have several books published and two short stories in Birmingham City University anthologies, where, after half a lifetime, I finally completed my MA in Creative Writing.